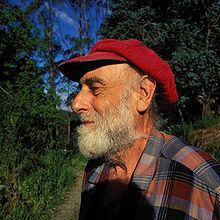 Friedensreich Hundertwasser (15 December 1928 – 19 February 2000), born Friedrich Stowasser, was an Austrian painter, architect, and sculptor. We must at last put a stop to having people move into their quarters like chickens and rabbits into their coops. Only when architect, bricklayer and tenant are a unity, or one and the same person, can we speak of architecture. Everything else is not architecture, but a criminal act which has taken on form. Today we live in a chaos of straight lines, in a jungle of straight lines. If you do not believe this, take the trouble to count the straight lines which surround you. Then you will understand, for you will never finish counting. The straight line is godless and immoral. This page was last edited on 12 April 2018, at 12:47.